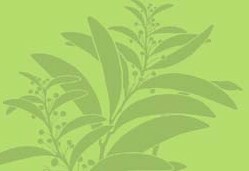 Halgania andromedifolia Behr & F.Muell. Description: Erect, aromatic shrub to 1.3 m high; hairs simple. 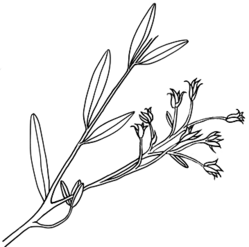 Leaves narrow-elliptic to oblong, 1–2.5 cm long, 3–6 mm wide, apex obtuse, margins entire and slightly to strongly revolute, upper surface viscid; petiole to 2 mm long. Inflorescence terminal, of 1 or more short monochasial cymes. Flowers 10–15 mm diam., deep blue; pedicel 3–10 mm long. Sepals 4–5 mm long, unequal, the outer 2 or 3 broader, fused in the lower third. Corolla lobes 5–8 mm long; tube rather short. Anthers 3–4 mm long, appendage c. 1 mm long. Drupe mostly with 1 pyrene. Distribution and occurrence: west of Balranald, uncommon.